Kutsinta (Kuchinta or Cuchinta) is a popular Filipino native delicacy that is often orange/brown in color. This sticky rice cake is made from rice flour and best or usually served with grated or shredded coconut. Kutsinta is a Filipino snack (merienda) that is pretty easy to make. The ingredients is not that hard to get and the cooking instruction is fairly easy to follow that even non-regular cooks can do. If you wanted to make Kutsinta at your very own kitchen for you and your family to enjoy, check and follow the basic recipe below. 1). Melt the brown sugar in a hot water, then add the lye water. 2). Mix and dissolve thoroughly the glutinous rice flour and rice flour. 3). Strain to remove lumps. Add the red liquid food color. 4). Pour the mixture at your molds (muffin pan will do). Make sure to brush the muffin pans first with oil to avoid sticking of the mixture to the mold. 5). Steam for 35 minutes or until its sticky enough. Remove from heat and let it cool down for 10 minutes or so before removing from the mold. Serve with grated or shredded coconut as a dip. Enjoy! Kutsinta Tip: If there are any kutsinta leftovers and you decided to refrigerate it, make sure to re-heat it for few minutes so it won’t be that tough (makunat) to eat. Kutsinta Image By eLjeProks via Flickr shared under Attribution-NonCommercial 2.0 Generic (CC BY-NC 2.0) license. Where do you get the Lye water.I was been looking for one but I don't really know where to look. I"ve asked some friends but they don't know what Lye water is..Please tell me where to get one..thanks,..
Anu pong pwede ipalit s lye water? Anu pong pwede ipalit sa lye water? 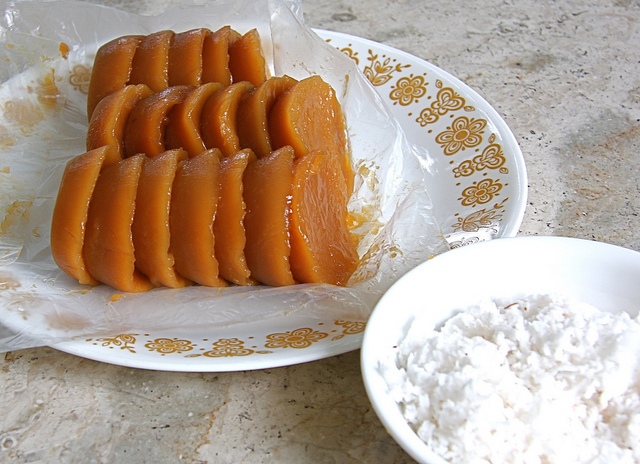 The Filipino dessert (kakanin) called kutsinta uses a bit of lye water to help give the rice flour batter a jelly like consistency. A similar process is also used in the kakanin known as pitsi-pitsi or pichi-pichi except that the mixture uses grated cassava instead of rice flour.